Paces Ferry is proud to serve Atlanta's rescue community. 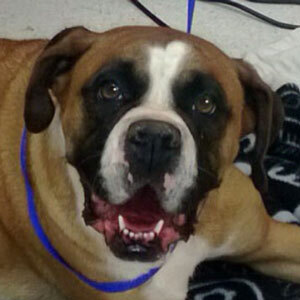 We have partnered with Atlanta Boxer Rescue and Best Friends - Atlanta. Please visit their sites if you are looking to add to your family. Before coming to ABR, Grace was considered a lost cause, even by several other veterinarians. She was found on the side of the road, paralyzed from the waist down, and thus, unable to walk. No one knew exactly what had happened to her, but the people at ABR knew that they had a great team of fosters and vets who could help her recover. It was determined that she had suffered a spinal injury, but with a lot of hard work, she would likely be able to overcome it. Because of her resilient spirit and strong will to live, she proved all of the naysayers wrong in grand fashion! During her time in the foster homes, she was able to rest, recuperate, and even learn to walk again- what a miracle! ABR’s wonderful organization helped her to get better through the use of chiropractic, acupuncture, and lots of TLC. Though her road to recovery was a long one, she is now living a happy, and healthy, life with her new pack. Speaking of her new pack, Grace really hit the jackpot when it came to her forever family! She was adopted into the wonderful pack at Boxertown, a “retirement home” for Boxers in need. Though it took a little while to get used to her new surroundings, Grace jumped (literally!) at the chance to live the life she deserved. Today, she can run, jump, and play, and it’s as if nothing was even wrong in the first place. She enjoys hikes with her pack, lots of playtime, and a tremendous amount of love. Not wanting her appreciation to go unexpressed, Grace shows all of her doggy brothers and sisters just how much she loves them by giving them huge, wet kisses every chance she gets! We are all so happy for Grace and her family - they are perfect together! This lady is certain to be a fan favorite, just like the drink. She is affectionate and endearing. She happily comes running for a cat treat, or tries to share your lunch when you are eating! This precious girl snuggles up very well and truly enjoys the company of dogs. She is searching for a home that will be cool and confident, like she is. Sangria is ready to pour into your heart forever! !